The Sound Level Meter for Environmental and Occupational Noise Measurement from Cirrus optimus green have been designed with ease of use as the most important feature which lets you get on with measuring and controlling the noise. The instruments use the very latest in digital technology and industrial design techniques to make everything as clear and simple as possible. All of the functions of the instrument are measured at the same time so there’s no risk of choosing the wrong setting, and with a wide 120dB measurement span you don’t need to worry about choosing the right range. Featuring a high resolution colour OLED screen and a keypad which will illuminate automatically in low light, the optimus instruments are ideal for any noise application. The measurement data is displayed in a clear and simple format along with a real-time noise chart so that you can see how the noise varies with time. A standard optimus can measure up to 140dB(A) and 143dB(C) Peak with the standard microphone and preamplifier, and up to 170dB using the optional MV:200EH High Level Noise microphone system. 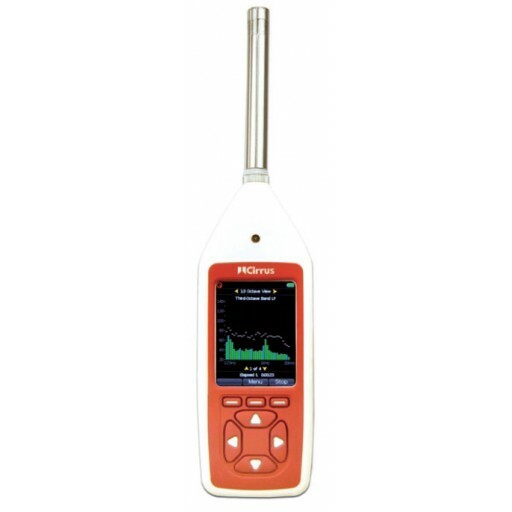 The optimus green sound level meters are ideal instruments for both environmental & occupational noise and will give you all of the information you need, right at your finger tips. Every measurement contains all of the available functions so there’s no risk of selecting the wrong parameter or function. For environmental noise applications, an optimus green is the ideal instrument. The overall Leq, Lmax and statistical Ln% values are measured along with a range of noise profiles providing a complete picture of the noise under investigation. The B & C variants will measure and store Real-Time 1:3 octave bands from 6.3Hz to 20kHz throughout each and every measurement, with the overall value along with a time history stored automatically. As well as the VoiceTag recording, the optimus green instruments provide audio recording during measurements using the Acoustic Fingerprint technology. Recordings can be started either manually or automatically when user defined triggers are activated. Audio recordings can be stored either as Studio 96/32 quality which can be used for later analysis, or as Standard 16/16 quality which can be used for replay and source identification. The D variants use either the ISO 1996-2:2007 Simplified Method or the Cirrus improved method to highlight tonal noise in 1:3 octave bands. Measurements can be either started manually or automatically by the measurement control functions. This allows the instruments to make repeated measurements over long periods of time, ideal when the instrument is used with an outdoor noise measurement kit. Measurements As well as the environmental noise functions, the optimus green instruments also provide a complete range of occupational noise functions. If you are working to the UK Control of Noise at Work Regulations or the EU Physical Agents (Noise) Directive, LAeq and LCPeak values are measured at the same time which allow the LEP,d (LEX,8h) and the Peak Action Levels to be determined. The exposure calculator also displays a projected LEP,d (LEX,8h) for the current measurement. The LCeq-LAeq (C-A) value is also measured which can be used to select PPE using the HML method. If you need to meet regulations such as OSHA HC & NC, MSHA HC or ACGIH, the two “virtual” noise meters in the Dose View can be quickly configured to provide you with this information. The optimus green A, B & C variants also feature real-time 1:1 octave band filters which can be used to aid in the selection of PPE and for noise control applications. NR & NC curves & values are shown on screen after a measurement. 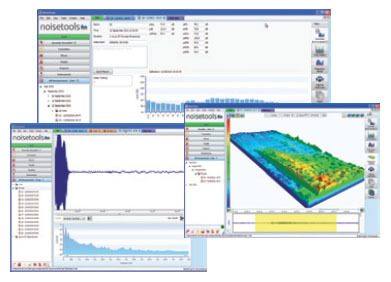 The NoiseTools software package gives you a quick and simple way to download, analyse and report your noise measurement information. The initial summary screen shows you the most commonly used information and, through simple icons, gives you access to the detailed measurement data. For advanced users, each and every function measured by the instrument is available for review and analysis and the data can be exported for further use. VoiceTag audio recordings can be played back for reference and are automatically stored with the measurement data, and audio recordings can be replayed and analysed in 1:12 Octave Bands. To help you keep your noise measurement data organised and easy to find, NoiseTools allows each measurement to be allocated to people, places and projects. NoiseTools is supplied free from any licensing restrictions or limits allowing you to install the program on as many PC’s as needed at no additional cost. AuditStore™ is a new technology that helps you to ensure that your noise measurement data is valid and trustworthy. AuditStore allows the user to verify measurements that have been downloaded to the NoiseTools software against a secure data store within the instrument. Each time you make a measurement with your optimus, a selection of the overall data is stored into a separate, secure memory that is independent of the main memory card. This data contains essential information about the measurement such as the time, date and duration, the LAeq, Peak(C) and LAFmax, LA10 & LA90 (where available) and the overload indication. In addition to the noise measurement data, information about the last calibration is also stored. The AuditStore data can be downloaded from the instrument when required and then the measurements can be checked against the AuditStore. The NoiseTools software will check that the measurement information held in the main database and displayed on the screen matches the values within the AuditStore secure memory. NoiseTools will display verification symbols if the information matches, a unique feature which will be useful in any legal proceedings. Complete measurement kits are available for the optimus instruments which contain the sound level meter, an acoustic calibrator, windshield, cables, batteries and accessories. 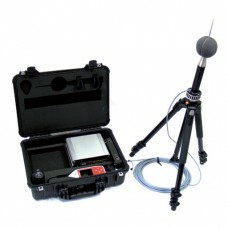 The measurement kits contain all of the accessories needed to carry out a noise survey.